In 1827, Hussein Dey, the Ottoman governor of Algiers, hit a French consul on the nose with a fly whisk during a dispute over unpaid French debts. And as the story goes, the rest is history. France soon invaded Algeria and stayed for over 130 years. But as our guest in this episode Jennifer Sessions explains, France's decision to invade and colonize Algeria beginning in 1830 was far less arbitrary and far more intertwined with domestic French politics than lore would have it. And while the invasion was partially about political divisions in France, even as French politics transformed French colonization in Algeria became a national consensus over the course of the 19th century. In this episode, we examine the importance of the early decades of French colonialism in Algeria for understanding what followed, and we consider the legacy of French colonialism in Algeria for France and Algeria today. Jennifer Sessions is Associate Professor in the Corcoran Department of History at the University of Virginia. Her research focuses on the history of French settler colonialism in Algeria, and she is currently writing a book about the Margueritte Insurrection of 1901. “Your turn, old man! !” Caricature published in Paris in the summer of 1830. Source gallica.bnf.fr / Bibliothèque nationale de France. This cartoon is one of a flood of caricatures published in France in the summer and fall of 1830 showing Hussein Dey of Algiers and King Charles X of France together as deposed monarchs. This satirical theme mocked the failure of Charles X’s effort to save his own tottering regime by invading “despotic” Algiers. Hussein Dey capitulated to French forces on July 4, and Charles X was overthrown by French revolutionaries barely three weeks later. “Scenes from the War in Africa,” from popular printing house Epinal, 1853. Source gallica.bnf.fr / Bibliothèque nationale de France. This kind of cheap, popular engraving circulated widely in France during the Algerian conquest. They helped to familiarize French audiences with the colonial army and its Algerian opponents, often in the form of military paper dolls intended for children. 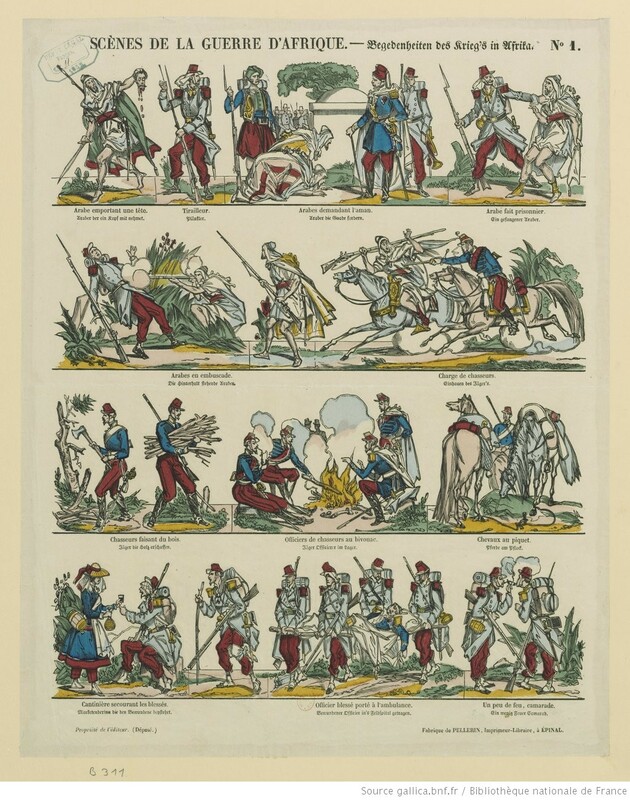 This example illustrates a variety of “typical” scenarios and troops from the Algerian conflict that consumers would have encountered in news reports at the time: the supposed perfidy of “Arabs” ambushing and decapitating French soldiers, or surrendering and being taken prisoner; the contrasting courage and self-sacrifice of French cavalry and infantry attacking, evacuating wounded comrades, standing guard, and making camp. Victor Levasseur, “Algérie. Colonie française,” Atlas nationale illustré, Paris, 1856. Source Cartography Associates, David Rumsey Historical Map Collection, University of Texas at Austin. 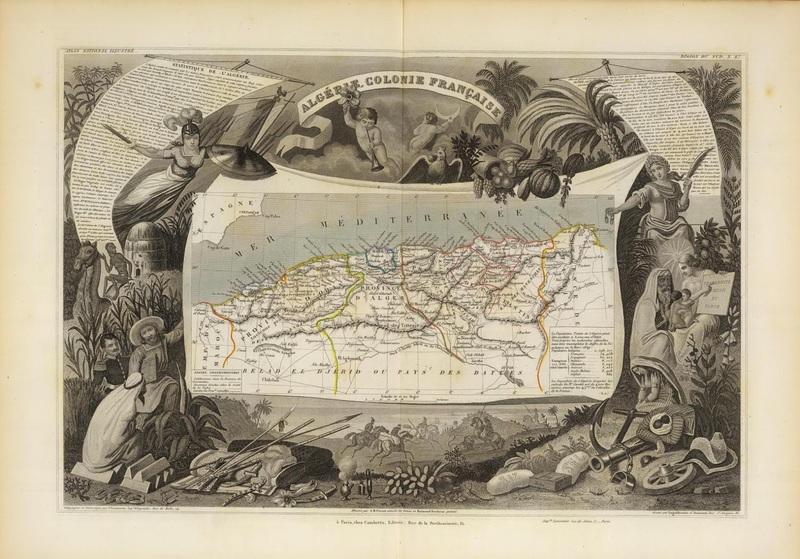 Illustrated maps like this one combined narrative scenes, statistics, and allegorical figures to depict Algeria as a “French” territory. 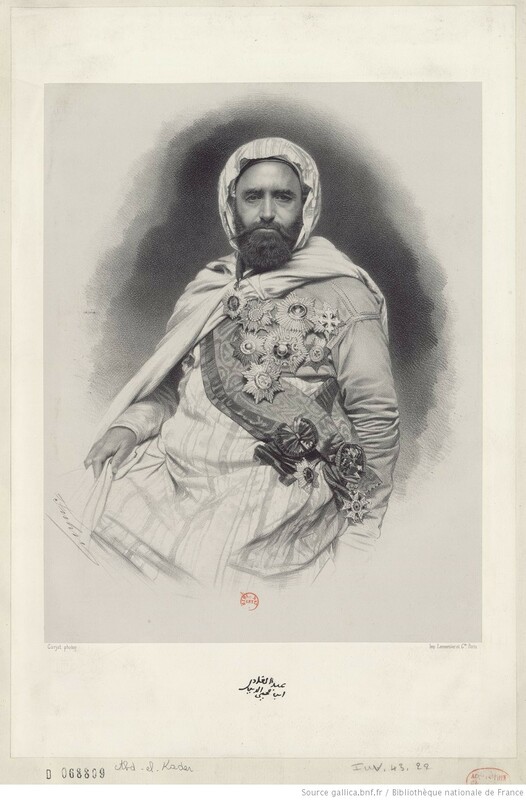 Abd al-Qadir, photographed by Étienne Carjot and engraved by Lemercier & Cie., 1865. Amir Abd al-Qadir ibn Muhyiddin led one of the major armed resistance movements against the French invasion, establishing a modernizing state in western Algeria supported by strategic alliances with Algerian tribes and the ‘Alawi monarchy in Morocco. Finally defeated by the French in 1847, Abd al-Qadir first was imprisoned in France and then settled in Damascus, where he devoted himself to religious study and charitable work. The amir was initially a deeply ambiguous figure in the Western imagination, which depicted him simultaneously as a religious fanatic and a courageous patriot. His image was definitively transformed in 1860, when he intervened to protect Maronite Christians from an outbreak of sectarian violence in Syria. This famous portrait was taken after those events, which are reflected in the array of decorations sent to him by leaders around the world. The decorations themselves can now be seen in the Musée de l’Armée at El Madania in Algiers. Abi-Mershed, Osama. Apostles of Modernity: Saint-Simonians and the Civilizing Mission in Algeria. Palo Alto: Stanford University Press, 2010. Aouli, Smaïl, Ramdane Redjala and Philippe Zoummeroff, Abd el-Kader. Paris: Fayard, 1994. Blais, Hélène. Mirages à la carte. L’invention de l’Algérie coloniale. Paris: Fayard, 2014. Brower, Benjamin Claude. A Desert Named Peace The Violence of France's Empire in the Algerian Sahara, 1844-1902. New York: Columbia University Press, 2009. Buheiry, Marwan. 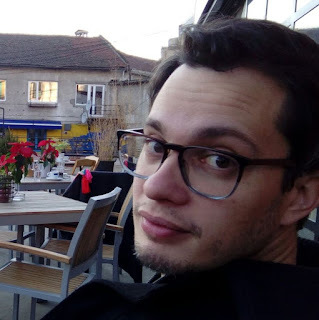 “Anti-Colonial Sentiment in France during the July Monarchy: The Algerian Case,” Ph.D. diss., Princeton University, 1973. Clancy-Smith, Julia. Rebel and Saint: Muslim Notables, Populist Protest, Colonial Encounters (Algeria and Tunisia, 1800-1904). Berkeley: University of California Press, 1977. Hannoum, Abdelmajid. Violent Modernity: France in Algeria. Cambridge, MA: Harvard University Press, 2010. Julien, Charles-André. Histoire de l’Algérie contemporaine. Vol. 1, La conquête et les débuts de la colonisation, 1827-1871. Paris: Presses universitaires de France, 1964. Kalman, Julie. Orientalizing the Jew: Religion, Culture, and Imperialism in Nineteenth-Century France. Bloomington, IN: Indiana University Press, 2017. Lorcin, Patricia. Imperial Identities: Stereotyping, Prejudice and Race in Colonial Algeria. London: I.B. Tauris, 1995. McDougall, James. A History of Algeria. Cambridge: Cambridge University Press, 2017. Rogers, Rebecca. 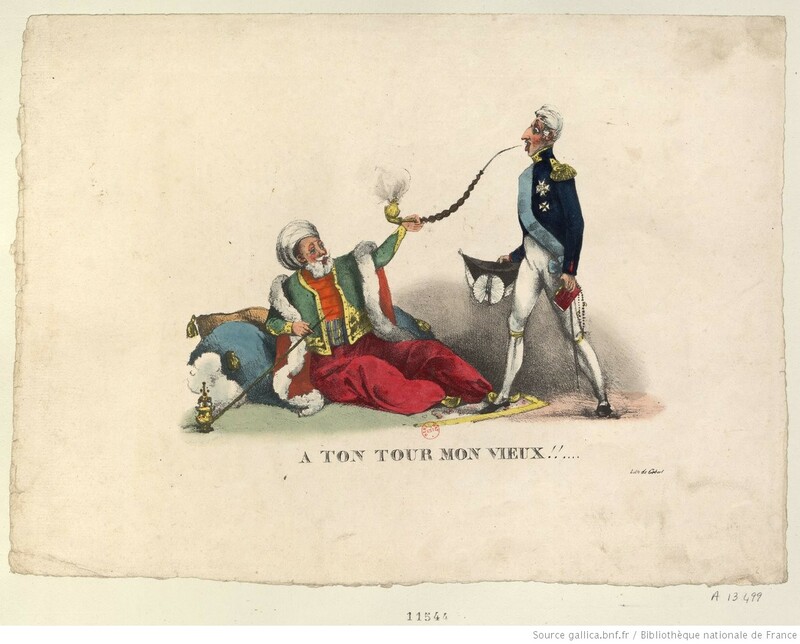 A Frenchwoman’s Imperial Story: Madame Luce in Nineteenth-Century Algeria. Palo Alto: Stanford University PRess, 2013. Schreier, Joshua. Arabs of the Jewish Faith The Civilizing Mission in Colonial Algeria. New Brunswick, NJ: Rutgers University Press, 2010. Sessions, Jennifer. By Sword and Plow: France and the Conquest of Algeria. Ithaca: Cornell University Press, 2011.